Iran, Jan. 10, 2019 - On Thursday, teachers were seen holding protests in a variety of cities across the country in Iran. 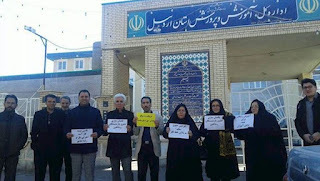 In Ardabil, northwest Iran, teachers held a gathering to both express solidarity with their colleagues in other cities, and protest low paychecks and regime officials refusing to provide answers to their demands. This gathering was held outside the city’s Education Department. On Wednesday, the city of Isfahan was also witness to teachers holding a rally outside their Education Department, protesting low wages and not receiving answers to their long-stated demands. In response, the mullahs’ regime dispatched large units of anti-riot forces riding motorcycles, along with state police, to the protest site, aiming to prevent the expansion of this rally. The teachers, however, braved all the circumstances and endured the winter rains to continue their demonstration. A look at why Iran’s teachers are protesting is necessary. Since May, many cities across have seen protests by teachers and other education workers. The protesters demand the Iranian regime to respect the most basic rights of teachers, students and the people of Iran. The protests have spread to dozens of cities across the country. Teachers have been protesting over the government’s mismanagement causing unemployment, unpaid wages, and inflation. However, this new wave of teachers’ protests is the largest one of its kind Iran has seen in the past year. The protests are taking place despite the regime’s crackdown on demonstrations and assemblies across the country. The teachers of Iran, who will be training and educating the future generations of Iran, are teaching their students a different lesson, and their classroom is the streets.